Please contact John Yarskinsky to request a FOUO copy of the full test report from independent government laboratories. The purpose of this document is to define the performance, areal density, and general features of DDM's McCurdy's Armor® - armor configuration Level 1. 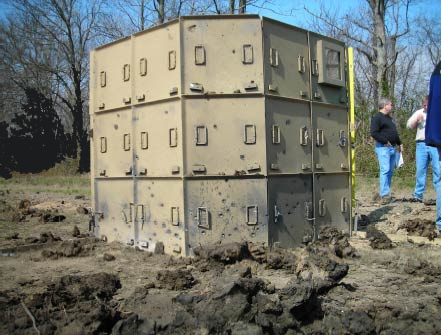 McCurdy's Armor® (Portable Armor Wall System) is a rapidly deployable armor system comprised of frames and panels that can be configured in various walls and enclosures to provide various levels of ballistic and blast protection depending on mission requirements. DDM has defined Level 1 by a single layer 1/4" armor alloy steel at approximately 10.2 pounds per square foot. NIJ Level 0108.01, Level III, which corresponds to 5 shots with the 7.62 x 51 mm M80 Ball, full metal jacket (FMJ), 150 grain bullet, lead core at 2750 +/- 50 feet per second (fps), which is muzzle velocity. This specified steel has also demonstrated protection against the following threats. Note 1: V50 defined in MIL-STD-662 for example. Welded lock handles have stopped the M80 ball at 2713 fps and the LPS ball at 2854 fps. Against the 7.62 x 51 M80 ball, an improved mechanically assembled lock handle demonstrated a V50 > 3250 fps for a direct hit. Against the 7.62 x 51 M80 ball they demonstrated a V50 = 2639 fps for a direct hit. DDM is working to improve this performance and recently tested a prototype handle attachment achieving a V50 = 2743 fps. Against the 7.62 x 51 M80 ball they demonstrated a V50 ranging from 2608 to 2786 fps. Reproduction and dissemination only with the approval of Dynamic Defense Materials. The purpose of this document is to define the performance, areal density, and general features of DDM's McCurdy's Armor® - armor configuration Level 2. DDM has defined Level 2 by two layers 1/4" armor alloy steel separated by the width of the McCurdy's Armor® frame. This specified steel as a single sheet has also demonstrated protection described in the McCurdy's Armor® Level 1 document. In the Level 2 configuration the steel armor has been tested against various threats as listed below. Against the 0.30 Cal AP-M2 for direct impact on the locking handles there were no penetrations of six shots from 2953 – 3648 fps. Against the 0.30 Cal AP-M2 for direct impact over the welded portions of the hooks the V50 was over 600 fps above muzzle. Against the 0.30 Cal AP-M2 for direct impact over the bent lips in the system, the V50 wasover 600 fps above muzzle. McCurdy's Armor® systems in wall and corner configurations with Level 2 armor, steel front and back, with stanchions and with or without ground stakes have been tested against 32.8 lbs of TNT. At 15 foot range for a corner configuration and 20 feet for wall configurations, McCurdy's Armor® structure withstood the forces from the blast remaining erect and with all back side armor panels intact. In tests against an IED with 32.8 pounds of explosive wrapped in 3/8" mild steel cubes for fragmentation, level 2 armor positioned on the top third of a corner set-up withstood the forces from this threat at 9.98 feet (3 meter) range. The purpose of this document is to define the performance, areal density, and general features of DDM's Level 4 Armor Configuration with Sand Fill. DDM has defined Level 4-Sand Fill as the performance achieved by two layers of 1/4" armor alloy steel separated by the width of the McCurdy's Armor® frame plus a fragmentation blanket and filled with sand. Minimum of protection against the 17 grain fragment simulating projectile with a V501 of 1700 ft/sec. 50 Caliber AP-M2, 708 grain hard steel core. Muzzle velocity is 2845 fps. Ballistic Limit Testing at H.P. White, zero degrees obliquity. V50 > 3000 fps. Testing stopped due to velocity limitations of the weapon. 20 mm Fragment Simulating Projectile (FSP) per MIL-DTL-46593B, 840 grain, chisel nosed cylinder, 30 Rockwell Hardness C Scale V50 > 5335 fps. Testing stopped due to velocity limitations of test barrel. .50 Caliber AP-M2, 708 grain hard steel core. Live fired from sniper rifle, tripod mount, fired from prone position on ground. Military Specified powder load. Impact velocity 2635 fps, impacted so close to the edge it barely engaged the sand fill. No penetration. Put a small ding in the second sheet ofsteel. .50 Caliber AP-M2, 708 grain hard steel core, cartridge loaded following military specifications. Live fired from sniper rifle, tripod mount, fired from prone position on ground. Impact velocity 2621 –2629 fps, 3 shots. No penetration. Projectiles stopped in the sand, no projectile contact on second sheet of steel. 7.62 x 54R, B32 API, 155 grain hard steel core. Live fired from prone position using Mosin-Nagant rifle. Eight (8) shots on and near panel to panel seams. Impact velocity ranged from 2747 – 2910 fps. No penetrations. Shot into overlap lip stopped by under layer. All other projectiles captured by the sand fill. IED, 32.8 lbs of explosive wrapped with 3/8" mild steel cubes exploded against McCurdy's Armor® in corner configuration with stanchions and ground stakes located at 3 meter range. System fully intact. System stopped 100% of the frags. McCurdy's Armor® corner configuration with stanchions and ground anchors. Bottom 44" was configured with front and back steel, sand filled. Top 22" was configured with front and back steel and no sand fill. Left hand side used frag blankets. Right hand side had no frag blankets. After blast test with IED, 32.8 lbs of explosive wrapped with 3/8" mild steel cubes at 3 meter range, structure is erect and protected 100% against fragments. DDM has defined the PN: 01FM0004 as the performance achieved by one layer of 1/4" armor alloy steel with a 35 psf DiamondView™ window mounted into it, with appropriate frame, hinges and handle to allow the window to be opened for example for return fire purposes. This part weighs about 105 pounds and is supplied with two sets of lift handles for a two person lift. Steel panel parts, welded features, bent lip, hooks, handles and twist locks are attached using the same procedures as for configuration one and are represented by the ballistic data reported in Document PSEV-001. The frame and bolt system around the glazing has been tested and withstood the 7.62 x 51 mm M80 Ball at 2726 – 2760 fps. Recently, a live fire test was conducted by the Thailand military in January 2012 in order to evaluate McCurdy's Armor. The Improvise Explosive Device (IED) used in testing was built by the customer to simulate threats that are currently being used against them in theater, with a standoff that they deemed to be realistic. The test configuration of McCurdy's Armor is shown in Figure 1. This live fire test was conducted for the expressed purpose of demonstrating McCurdy's Armor to the Thailand military. The data collected was purely empirical and documented through visual checks and pictures. McCurdy's Armor was configured to facilitate testing of two different protection levels. The two protection levels tested were McCurdy's protection levels: MP and XP Plus. MP protection is defined as two single McCurdy's Armor panels separated by the width of the standard aluminum frames for the system. XP Plus protection is defined as two single McCurdy's Armor panels separated by the width of the standard aluminum frame with sand sealing the area between the panels. 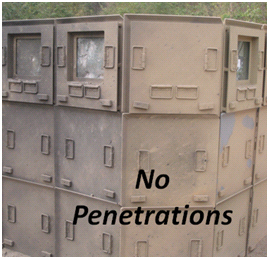 This configuration (McCurdy's Armor – U Kit) consists of a three sided structure with each side having two McCurdy's Armor panels wide and three Armor panels high. The forward facing side was divided into left and right configurations with the XP Plus configuration being the lower left two armor panels when facing the threat and the MP protection level being the right two lower armor panels. The third row up was assembled using double armor gun ports which included a transparent armor hinged window. The angled corners of the kit consisted of McCurdy's Armor double armor panels on the top row and single armor panels on the lower two rows. The roof assembly was not included in the live fire test. The live fire setup consisted of McCurdy's Armor U kit with an IED placed at a distance of 3 meters (9.8 feet) in front of McCurdy's Armor as shown in Figure 1. 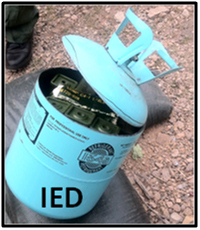 The IED used in testing was assembled by the customer using 1 lb. of C4, 15 lb. of TNT, and 10 lb. of mason nails packed in a propane tank (See Figure 2, below). McCurdy’s Armor system was extremely successful in defeating this IED threat. Frame assemblies assisted in mitigating the blast force and still had enough structural capability to hold the armor protection in place (see Figure 3, below). 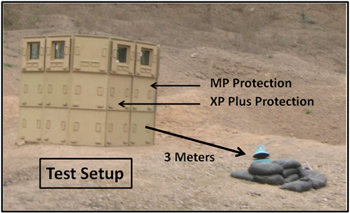 Based on the results of this live fire test, it was found that McCurdy’s Armor in both the MP and XP Plus protection levels offers significant protection to the IED threat described above. Notable results can be concluded from this live fire evaluation. First, the armor kit withstood the blast wave maintaining its shape, form and its structural integrity. Secondly, there was no fragmentation penetration to the crew compartment area.